YUM! Save money on this sweet deal! February 6th is National Frozen Yogurt Day, so here’s the scoop: we are going BOGO on the FROYO! Menchie's Frozen Yogur t is offering a promo all day Wednesday at all 10 of their Valley locations; It's buy one yogurt, get one free -- no coupons needed! You don't have to spend any cash at Yogurtology ! All day Wednesday, get a free six-ounce FROYO! Want more? Wednesday and Thursday, they're having happy hour. From 5 to 7 p.m., buy one yogurt, get another for half off. 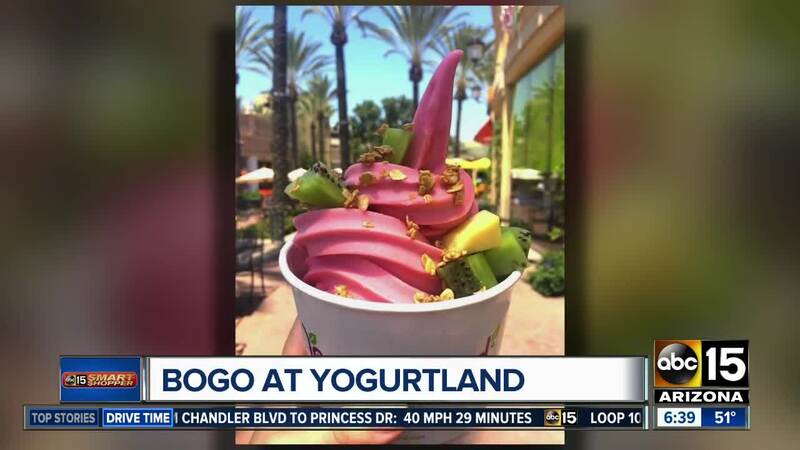 Yogurtland is celebrating Wednesday from 2 p.m. to 7 p.m. with the same offer…buy one, get one free. Since this is the eighth year this self-serve joint is celebrating this holiday there will be two limited-edition Hershey's flavors available: chocolate toffee bar with Heath Bar frozen yogurt, and peanut butter cup made with Hershey's cocoa and Reese's Peanut Butter frozen yogurt. They will also have limited-edition Hershey's toppings. Carvel doesn’t have frozen yogurt but they do have a deal on their cool treats. They offer a BOGO Sundae deal every Wednesday, and National Frozen Yogurt Day happens to be on a Wednesday this year...perfect timing!